Quality Australian Made Sheds Delivered Australia Wide. For a no obligation quote please phone 1300 887 433, or take the time to fill in our quote form. Don’t forget to check out our Clearance Page as there are some great deals. Quality & Service matters, and that’s what you get from Sheds Galore. We only supply the highest quality Australian Made Shed, manufactured from BlueScope Steel, not cheap inferior imported steel from unknown origins. We have a range of standard shed designs, as well as being able to custom design your new shed. You also get old fashioned good service, the way it used to be. We are a family owned and run shed business, and we pride ourselves not only on quality of our sheds for sale, but also our service to you. 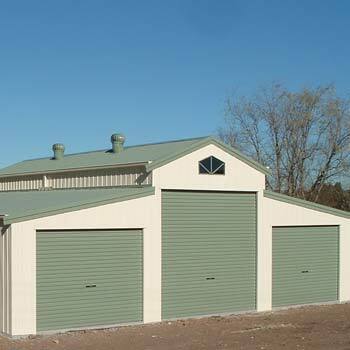 We are an Authorized Distributor for Fair Dinkum Sheds and we supply Shed kits Australia Wide. Sheds Galore has a huge range of Fair Dinkum sheds, garages, carports and industrial, farm and barn sheds, and shed kits for sale. We also do cyclone rated sheds for North Qld, the Northern Territory & North Western WA. Queensland-based with manufacturing factories all over Australia and Victoria, we can offer our quality products for sale anywhere from Brisbane to Melbourne to Perth, and even to remote areas of Australia. Our 22 manufacturing locations ensure that you don’t have to pay a fortune for delivery and helps you support your local business. We’ve been around since 2001, so we know what we’re doing. We’re a family owned business and believe in providing all our customers with the good, old fashioned service that is lacking nowadays. We only have the best quality shed kits for sale Australia-wide and online at the best prices. Each of our products are officially ShedSafe accredited and they are made using genuine BlueScope Steel manufactured right here in Australia. So what exactly can we offer you? Our products come in many shapes and forms. Please let us know exactly want you want and need and we’ll accommodate your requests. 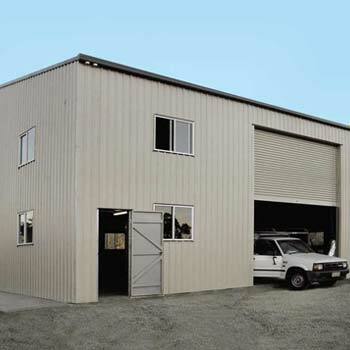 We supply single garages, double garages, triple garages, sheds with workshops or carports, American barns, quakers barns, farm and industrial shed kits, wide span sheds, skillion/monopitch roof variations, and even custom-made patios. We have roof pitches available in 11, 15, 22, 30 and 45 degrees. We give you a choice of 22 colours from the Colorbond range, plus Zincalume. You’ll be in control of choosing the number, size, style and location of doors. We’ve got roller doors, personal access doors, glass sliding doors, steel sliding doors and security doors in a variety of colours, sizes and styles. We can add a remote opener for ease of use. We’ll customise size, design and dimensions to suit your needs. You can store anything in a Sheds Galore shed, and you’re sure to find something to meet all of your needs. Whether for a rural farm, or for commercial and industrial use, we have the range of wide span variations available at prices you’ll love. We can deliver a shed kit or garage to Victoria or any other location in Australia, depending on your location. Our wide span barn sheds and garages are available for sale online at affordable prices. A fantastic choice for a variety of locations, you’ll find our products in use in QLD, NSW, Victoria, SA and across most other areas in Australia. Call us on 1300 887 433 for a quote or any other general enquiries! For a no obligation quote please phone 1300 887 433 or take the time to fill in our quote form. Don’t forget to check out our Clearance Page as there are some great deals. Click to see our great specials, available for a limited time. Contact us via our online quote form and we will call you back to discuss your quote needs. Sheds Galore use Colorbond colours. Colour charts, click here. Register your interest if you would like to increase your work and contract with us. A note to say thank you. This shed exceeds my expectations. Photos don't really do justice to the finished product. The overall finish, design, quality and workmanship are all incredible. I will pass on your details to anyone who asks about a shed Regards Ian T.
We have been extremely happy with the shed you supplied to us last year in Rockhampton. Our other son has just purchased a property nearby and would like exactly the same shed as you supplied previously. W.J. The Quakers barn I bought off you is fantastic. The shed is great and the recommended shed erectors did a good job. R.M. The shed we erected has just been through its toughest test. It withstood Cyclone Yasi and I can say not even a screw was loose. Thanks for a great shed. G.G. (This shed was supplied to Cardwell in Far North Queensland and withstood the worse that Category 5 Cyclone Yasi could throw at it).